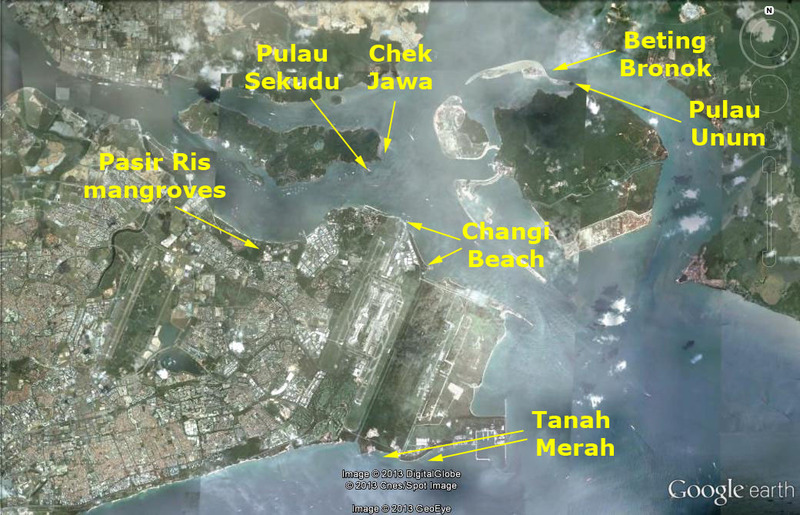 wild shores of singapore: What shores will Singapore lose in 7-million population plan? What shores will Singapore lose in 7-million population plan? How will Singapore's shores be affected by plans for a 7-million population by 2030? The landuse plan by the Ministry of National Development released today shows some of the shores that may be lost. These include Chek Jawa, Pulau Sekudu, Changi shores, Mandai mangroves and probably Pasir Ris mangroves too, if land reclamation (in yellow) plans goes ahead. To find out how our shores will be affected, I overlaid the MND map on the Google Earth map. Here's a closer look at some of the possible impacts. In the North, the plans include a road link (black line) from the mainland jumping off at Punggol, crossing to Pulau Ubin through Chek Jawa to jump off to Pulau Tekong before circling back to the mainland on Changi East. 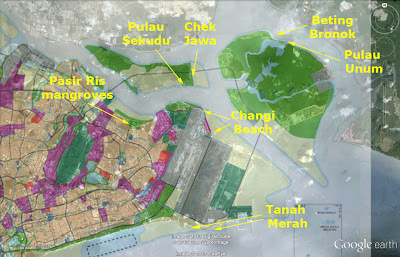 Proposed reclamation (in yellow) will bury Pasir Ris shores, Pulau Sekudu and Chek Jawa as well as a large amount of shore at Changi Beach. 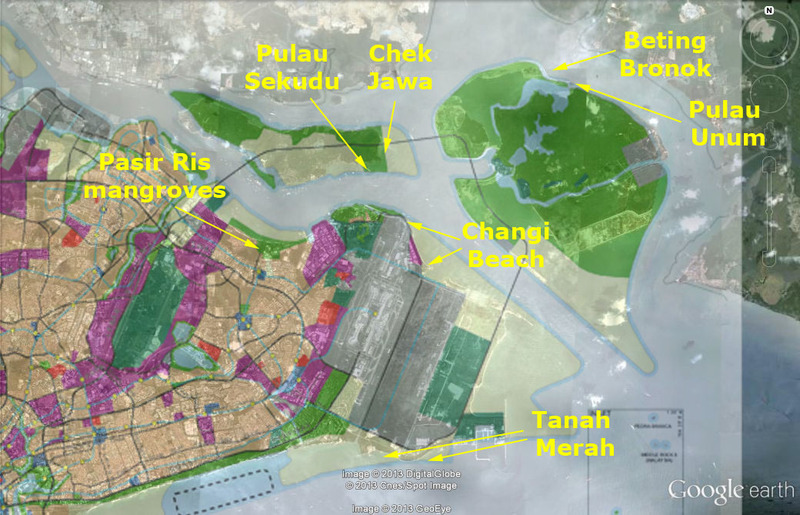 Additional reclamation at Tanah Merah is also in the proposal. Beting Bronok, a tiny patch reef and Pulau Unum, both off Pulau Tekong have been granted 'Nature Area' status. As I understand it, this status means the area "will be kept for as long as possible until required for development". Here's an earlier about 'Nature Area' status seem to mean. 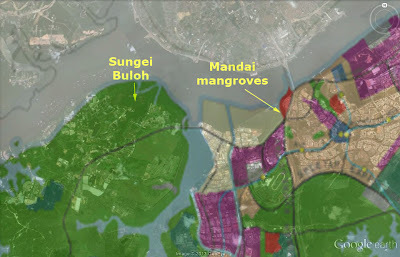 There also seems to be plans for reclamation (in yellow) that will bury Mandai mangroves and the Kranji mudflats. Although Sungei Buloh does not seem to be affected. Beyond 2030: MORE reclamation -- Goodbye Pulau Hantu? 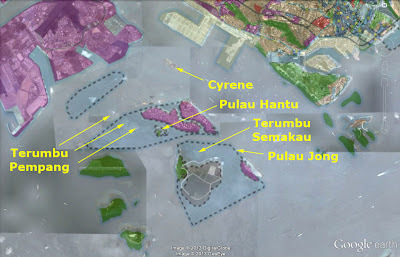 If plans for 'possible future reclamation' (in light blue surrounded by dotted lines) goes ahead, we will lose Pulau Hantu, Terumbu Pempang Darat, Terumbu Pempang Tengah and Pulau Jong and Terumbu Semakau. 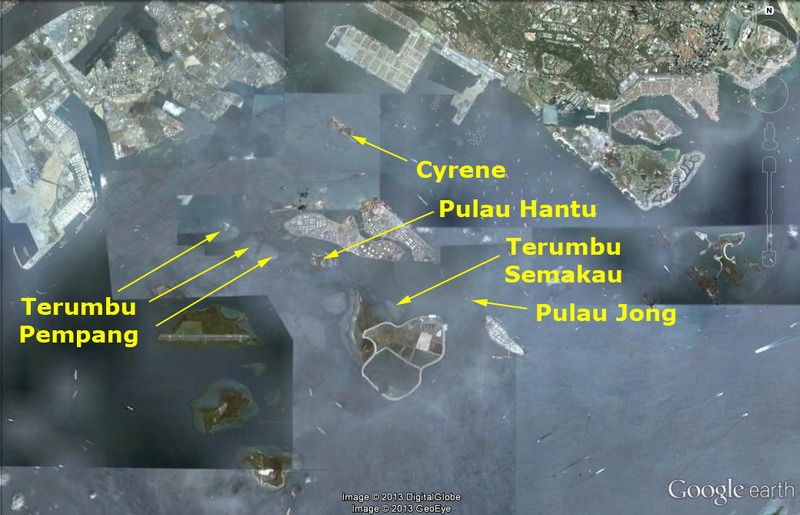 One spot of good news, it seems Cyrene Reef may be spared even post-2030. Will these plans be detailed in a new URA Master Plan? 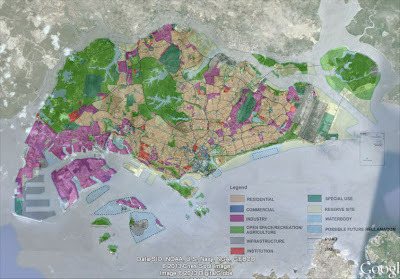 According to the URA website: "The Master Plan is the statutory land use plan which guides Singapore's development in the medium term over the next 10 to 15 years. It is reviewed every five years and translates the broad long-term strategies of the Concept Plan into detailed plans to guide development. 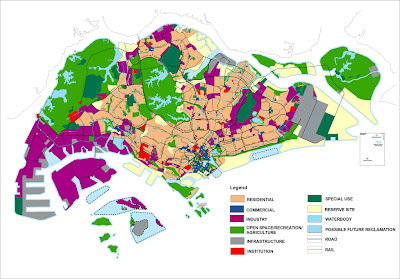 The Master Plan shows the permissible land use and density for developments in Singapore. The Master Plan 2008 is the current Master Plan." If the Master Plan is reviewed every five years, then we are due a new Master Plan in 2013? How will this Plan be different from the one unveiled today? What about climate change and rising seas? I couldn't find any mention of planning for climate change and rising seas in the plan. Singapore's northern shores and Pulau Ubin and Pulau Tekong, where most of the new developments will occur, lies at the mouth of the massive Johor River. Does the plan take into account the possibility of more rainfall and storms, and how these may change water flows down this River? 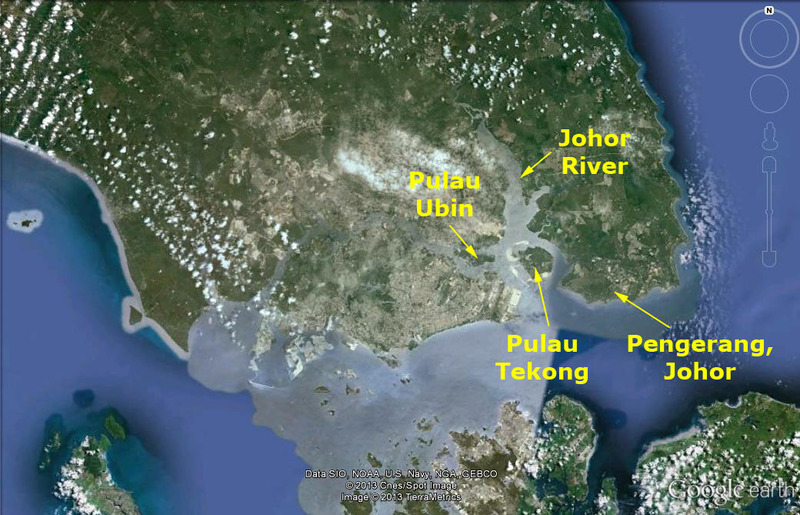 By the way, Malaysia has plans to develop massive petrochemical industries at Pengerang, Johor including a highly pollutive plant. 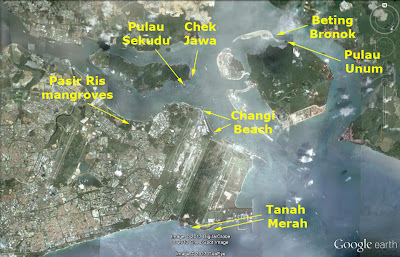 This is close to Pulau Tekong (as well as newly minted 'Nature Areas' Beting Bronok and Pulau Unum). I don't really know our terrestrial issues well enough to comment on impacts there. N. Sivasothi earlier posted about possible impacts of LTA's proposed Cross Island Line (CRL) that cuts through the Central Catchment Forest Reserve. What can one person do about this? We can't take our shores for granted!You can make a difference! Simply explore, express and ACT! Visit our shores before they are gone. Join nature activities at our wild places, like those listed on wildsingapore happenings. Share what you've seen. Volunteer for them. Where are Singapore's Nature Areas? 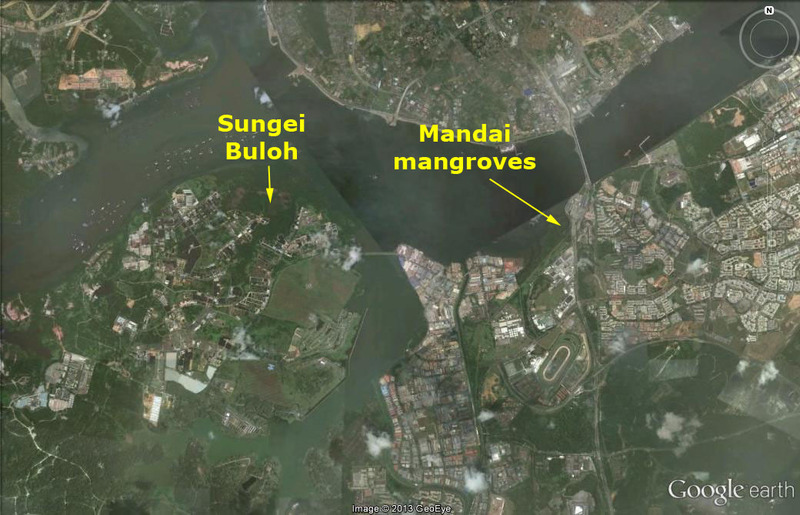 Sea level rise in Singapore: what effects? What can be found at the affected shores? Here's more info, photos and stories about our trips to these shores.